Poor Robin. Poor little cedar top Argapa. Damn you, ice covered slippery Swedish ground. We'll attempt to fix it. But first the customary 40 days of sorrow. 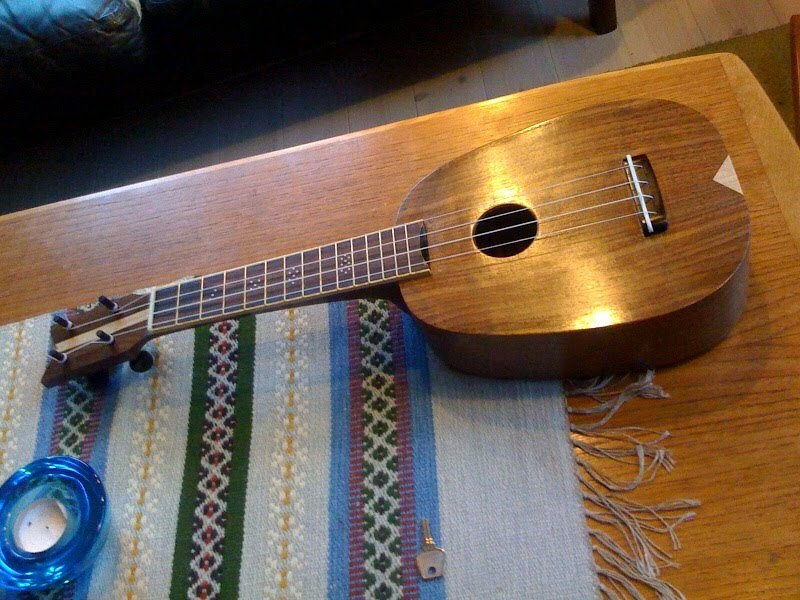 Aya's G-string soprano had two holes from strap buttons, one in the slender heel and one next to it where the screw missed the block and damaged the thin side. So I cut the hole clean and glued a small diamond shaped patch in it. And I put the new strap button in the neck block. And now I'll tell Aya it's done, I've looked forward to that. Three piccolos means three necks. I really enjoy carving, especially since I got a good deal on a high quality sharpening and honing machine. My chisels are now crazy sharp, as well as my planes. The one with the walnut stripe is most likely for Ian, the one with the blonde stripe will be offered to Andy in Switzerland. The third might go far far away. I'll attempt to send two parcels, one half-ready fretboard to Norway and the Argapa piccolo number 23 will get an extremely good home on the desert planet Tatooine (known as Arizona). My witty and accidentally comical buddy Brian D Newman (D is for dungarees) have made the epic mistake of selling some really nice ukes to make room for this tiny piece of ... wood. Fore- and background: laminating necks with center stripes. Two of these three will have them. Since I made Paolo's this way (by mistake), some people have demanded it. You know me - I'll be where the business is, making silly money! I'm not too happy with the saw. I should have bought the more expensive model. But the jig and the template is great. 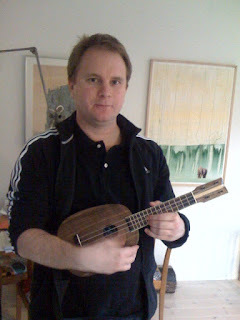 A nice guy in Norway emailed me to ask about where to get fretboards. 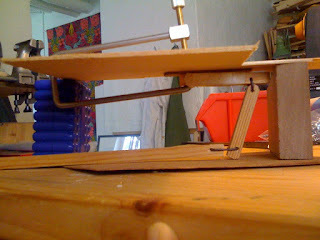 So I offered to make him one, I need to try my new concert length jig from Stewmac. Really nice rosewood on this. And the third piccolo got the lining installed. I was going to put the reverse kerfed lining strip on the third one as well, but guess what... 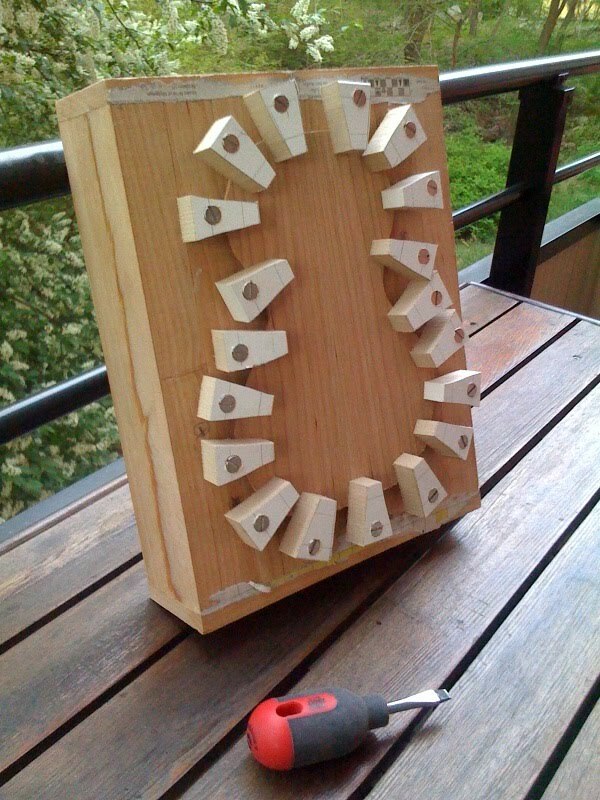 I'm out of miniature clamps and clothing pegs! The soundboard side of my piccolos have solid linings to maximize the "free" area of the top, but I make my own miniscule kerfed strips for the back side. A bit faster to install, and maybe a stiffer joint. Which ought to be a good thing for the back / sides joint. Fantastic day! I cleaned the workshop (actually found a place for the thickness sander), made and installed top side solid linings, made kerfed lining, picked neck blanks and am now glueing the first bridge patch. I even put a radius in the soundboard. I started three more. 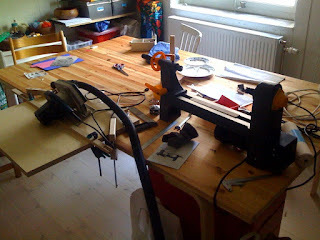 The workshop is a mess. It is the mother of all messes. But it sort of works somehow. The sides on these three (and some more to follow) are a little better than the previous ones. 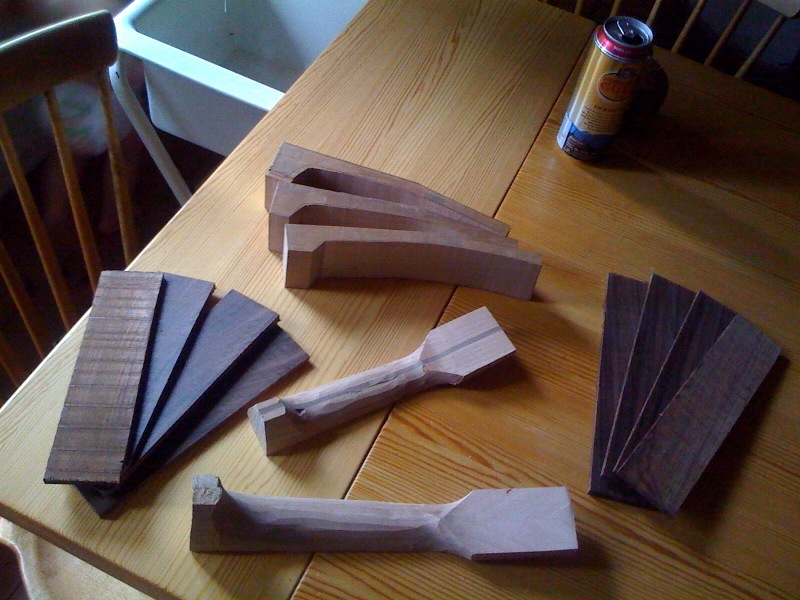 They are closer to being perfectly quarter sawn. I promised a long time ago that I would make some very small parts of the international Fun Build project, spawned by Vic on Ukulele Underground. Of course I forgot all about it. Almost. 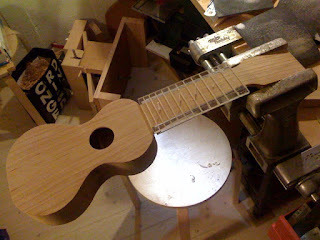 But the others have made a unique uke, and all of a sudden I was in a hurry. My name is already on the label! 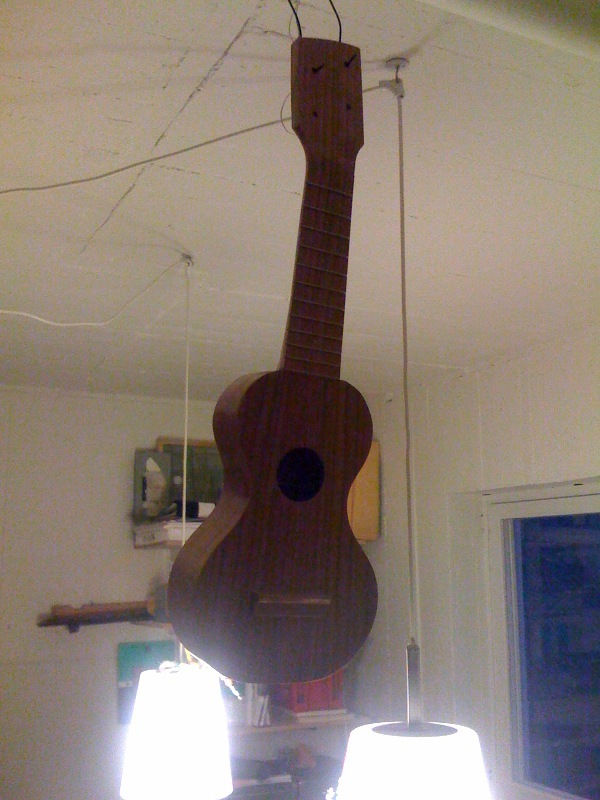 So I made these, and I'll ship them tomorrow to Brad Donaldson in Seattle, who's assembling the uke. I am not cloned, the instance to the right in the pic is really Lars. 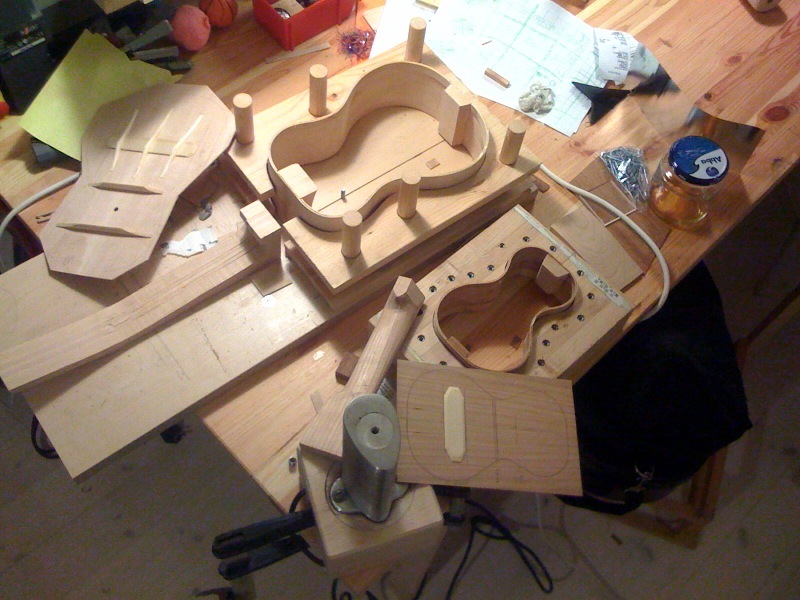 Lars will build a mezzosoprano of cherry under my stern and sometimes angry guidance. This was the first actual building session, and the plates for top and back were joined. No picture this time, but a link to a swell recording! Alli of Ukulele Cosmos made it and I think it's great. And my first scraping away of the finish is done! 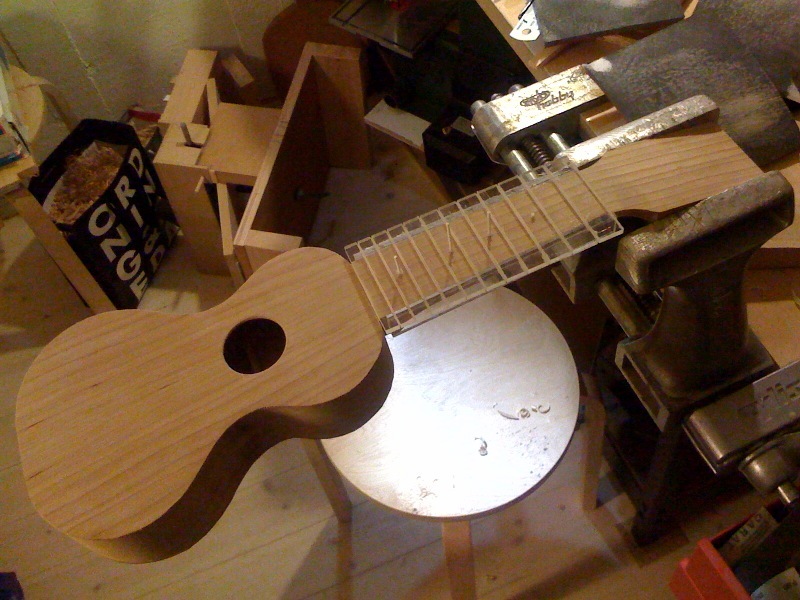 Hopefully the rest of the process is as simple, then the uke is sort of complete. Tape is removed from where the bridge goes. Hopfully the shellac won't be ruined by the masking tape. It's time consuming, but I'm getting closer. Look at that curl. To learn about french polishing, check out milburnguitar.com. Or milburnguitars. They have an excellent tutorial, as I tried to tell them in an email. But the address was faulty. Anyone knows how to contact them, tell me pls. Crikey! What a mess. I am forcing my way forward to finish Alli's tenor before going to Hollesley, and one more piccolo might join it. I really should put tuners on Jukka's piccolo, and a nut. I'm in such a hurry I even bought pre-cut kerfed linings. But my extra soprano for the Hollesley raffle, that won't be ready. But who'd wanna win a uke that was thrown together in a haste? I'm sorry. No posts in a month. I've had too much to do at the day job. of shellac, and I'm working on Alli's fretboard. Or at least I'll cut the slots. This is so much fun! 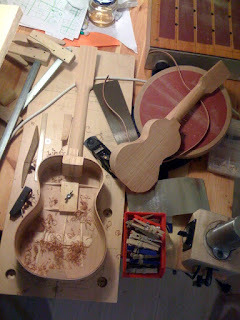 neck is carved and bolted on, and solid linings are installed. 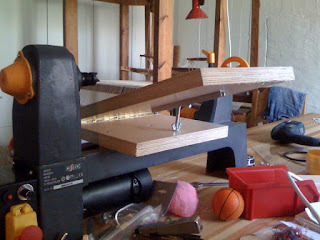 soon only fretting and bridge work remains. soundboard fits. And I need better spacers to hold the sides firmly. these moulds for each size, obviously. This is an attempt to show you a lot in a single pic. and blocks and linings glued, neck almost completely carved. so proud. 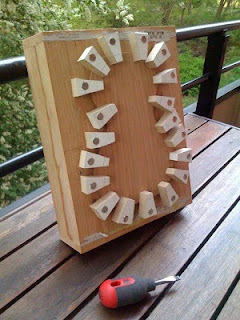 I have to make one for my next tenor. the patch up against the top. split on the bandsaw yet. Thickness sander mk II, cont. drum and the dust collector to fabricate. I could make several drums and use one for each grit. saved them for my kids to play with, so it's almost the intended use. The shellac has dried and Markus is here to collect it!